On May 8 2012, WTR announced the winners of its sixth Industry Awards at an exclusive ceremony in Washington DC’s National Museum of Women in the Arts. The awards are designed to recognise the vital work carried out by in-house trademark counsel, and identify the teams and individuals that are performing their functions to the highest possible standards. Over the following pages we speak to the winners and explain why they were judged to be leading examples of industry best practice. 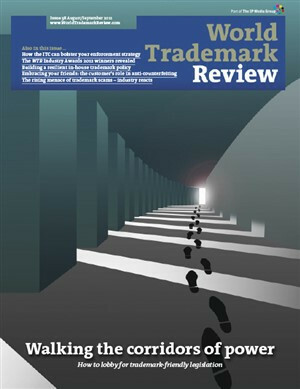 New laws are drafted and crucial decisions made far away from the offices of trademark practitioners. So how can counsel ensure that their voices are heard in the corridors of power? As WTR went to press, the Court of Justice of the European Union (ECJ) issued its decision in Chartered Institute of Patent Attorneys v Registrar of Trademarks (Case C-307/10), often referred to as the IP TRANSLATOR case. In Formula One Licensing BV v OHIM (Case C-196/11 P, May 24 2012), the ECJ set aside a decision of the General Court, holding that the latter did not have jurisdiction to question the validity of a national trademark used to oppose the registration of a CTM. In Chocoladefabriken Lindt & Sprüngli AG v Office for Harmonisation in the Internal Market (OHIM) (Case C-98/11 P, May 24 2012), the Court of Justice of the European Union (ECJ) has put an end to Lindt’s hopes of securing a Community trademark (CTM) for its gold foilwrapped chocolate rabbit with a red ribbon and small bell. Almost one and a half months later than originally planned, the Internet Corporation for Assigned Names and Numbers (ICANN) has revealed the first batch of applications for new generic toplevel domains (gTLDs) at a press conference held in London. Greece’s new trademarks law: was it worth the wait?